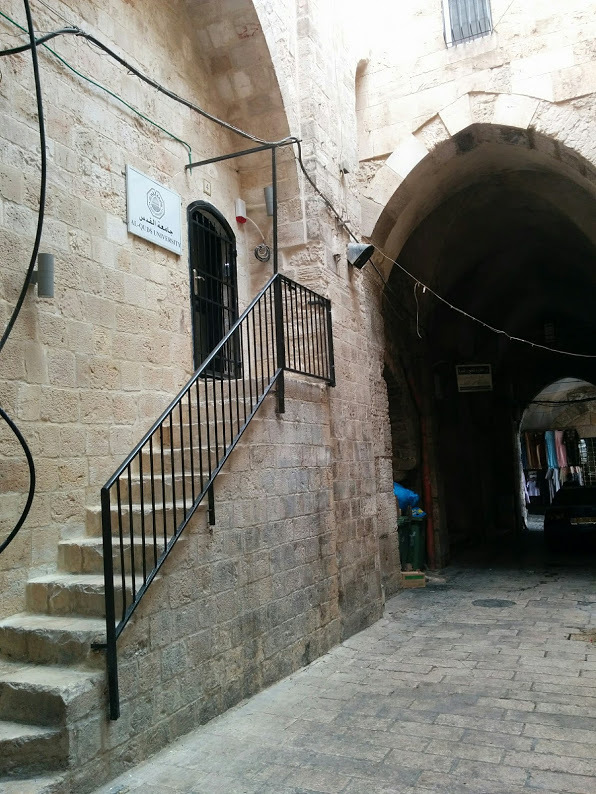 Along the 5th and 6th stations of the Via Dolorosa, towards the end of Tareeq al-Wad leading to al-Aqsa and al-Bouraq and inside Souq al-Qattanin stands an old, beautiful caravan saraya named Khan Tankiz. This Mamluke site contains Hammam al-Ayn and Al-Shifa, two main public baths which, since their construction in 1300 until the early 1970’s, were used by Old City inhabitants. Now, and for more than 16 years, this location has hosted the Centre for Jerusalem Studies - al-Quds University. Since its opening in 1998, as part of al-Quds University, the Arab Palestinian Academic Institution which offers education to over 13000 students in Jerusalem, the Centre has worked hard to become a forum for researchers concerned with Jerusalem. Important work includes the launch of a multi-disciplinary MA degree program in Jerusalem studies, which provides a necessary concept of Jerusalem and meets the needs of the local and international communities. It also includes building an online Jerusalem Virtual Library, a unique academic database on the history of the city containing over 5000 documents from books to manuscripts and a photography archive. A special focus has been placed to develop and support the University’s prerequisite course on Jerusalem, which is attended by all al-Quds University students. The course aims to develop dynamic group projects on and about the city of Jerusalem, includes guided field visits in the old city, and seminars by visiting scholars to discuss and debate topical contemporary issues on the city. The Centre for Jerusalem Studies has through its diverse activities, obviously been dealing with different categories of institutions and people living in Jerusalem. Hence, the Centre has gradually been working on identifying a series of needs expressed by the local community. In addition to exerting efforts to satisfy the needs of the local community, as a priority, especially in terms of offering educational and cultural programs, the Centre also invites the international community, those residing in Jerusalem and working in cooperation with the Arab community, to study Arabic. Courses in spoken and fussha run throughout the year under the program “Learn Arabic in Jerusalem”. Al-Quds Tours, a weekly activity of the Centre reflects the Palestinian perspective of what remains of the city's architecture and civilizations. These walking tours take place mostly in the old city showing the cultural heritage, the political and social facets of the city, from Canaanite, Crusadors, Mamluk and Ottoman Jerusalem to the settlements scene, the Israeli wall and areas with mass house demolition. The tours are organized regularly for the International community, students and friends of the centre. Moreover, the al-Quds Tours program reaches out to West-Bank refugee-camp school children under the age of 14, who have not yet received their ID cards through a special program called (Ya Makan Ya Quds). It brings them to Jerusalem to spend the day which is critical, as once they are assigned West Bank ID cards, they will be prohibited from entering the city. By touring Jerusalem they will see its history, its civilization, and its culture. It is also a matter of feeling confident about their identity”. 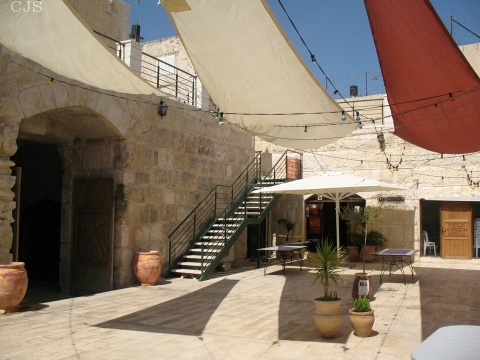 During Ramadan 2000 the Centre began its first special Ramadan Nights in the Old City. Story teller Radi Shehadeh from al-Jalil inaugurated Layali Ramadan with the story of “Abu Zeid Al Hilali” in front of hundreds of children. The Centre also held Sufi musical nights at the Naqshabandyas Sufi mosque, and the children's lantern march has become a legacy during Ramadan and other festive seasons. Hammam al-Ayn is a Mamluk bath; it was used until the early 70s as a bath house for the residents and visitors of the Old City. In 1998, Al Quds University signed an agreement with the Waqf Institution to use and activate the place. The Centre aims to open Hammam al-Ayn in January 2009 to celebrate Jerusalem the cultural capital of the Arab World. Moreover, late 2011 al-Quds University signed another contract with the Wakf Institution to use and activate Hammam al-Shifa. During the past years the centre invited artists and musicians to perform in the restored hammam. al-Kamandjati came to give a concert, confronting the Israeli checkpoints and wall with their pianos and violins. In the summer of 2006 Hammam al-Ayn became the venue for a photographic exhibition of the Gazan artist Tayseer Batniji’s work , the exhibition was organized in cooperation with the French Cultural Centre, who also invited Naili, the French-Algerian rapper, to play together with G- Town, a young group from Shufat Refugee Camp. Despite daily provocation by neighboring settlers and Israeli police men, the Centre is determined to affirm its presence by its continuous cultural and educational activities, and by welcoming different researchers and artists like, Suad Massi, who visited the centre during her recent visit to Palestine, and Michael H.Burgoyne, the author of the book “Mamluke Jerusalem”, who told us about his last bath at Hammam al-Ayn in 1973.